Luxury ski chalets have come a long way in the last decade or so, making a winter break even more tempting. These days the ultimate chalet has every extravagance you need or want on your ski holiday so that when you walk in at the end of the ski day, you have no need to leave until you set off for more skiing the following morning. From high-end kitchens and well-stocked wine cellars to state-of-the-art home cinemas and in-house spas and swimming pools, the team at Nidski have drawn up their list of top 5 must-haves that buyers look for when searching for their ideal dream ski chalet. Direct slope access is the holy grail of ski chalets and often top of the list when buying a ski home. Much like oceanfront properties, ski-in/ski-out chalets are the most sought-after ski homes in the mountains. On a ski holiday, there is nothing better than stepping into your skis and directly onto the piste from the front door of your chalet – plus returning direct to your property the end of the day. No cars, no walking, no hassles. Just the ultimate in skiing convenience and a luxury few would choose to live without. Most ski resorts offer some kind of ski in-ski out accommodation, but our favourites are the French ski resort of Courchevel, Zermatt in Switzerland and Aspen in the USA. Relaxation and a bit of pampering is important after a long day on the slopes, and a spa at home is the ultimate chalet sanctuary. Most buyers expect luxury chalets to come equipped with a hot tub and sauna as the bare minimum, but indoor swimming pools, fitness areas and a designated space for massage and treatments are now becoming the norm. Property developers in Megeve have turned the in-chalet spa into an art form - one high-end chalet in the chic French ski resort even has its own hairdressing salon. The relative seclusion of many prime ski chalets makes entertainment an at-home event. A recent chalet in Val d’Isere included an indoor climbing wall, while home cinemas have long been the start of luxury living. Being able to watch movies on the big screen in the comfort of your own home is a perfect way to bring the fun of a movie night to the mountains – as well as a good fall-back for bad weather days. State-of-the-art sound systems are a must in any luxury chalet, particularly when the après party happens back at your house. For après into the small hours, the hospitable chalet owner will often look to add a bar area where they can demonstrate their cocktail mixing skills. Few luxury ski homes are without a well-stocked (and well looked after) wine cellar. After all what are basement floors for? 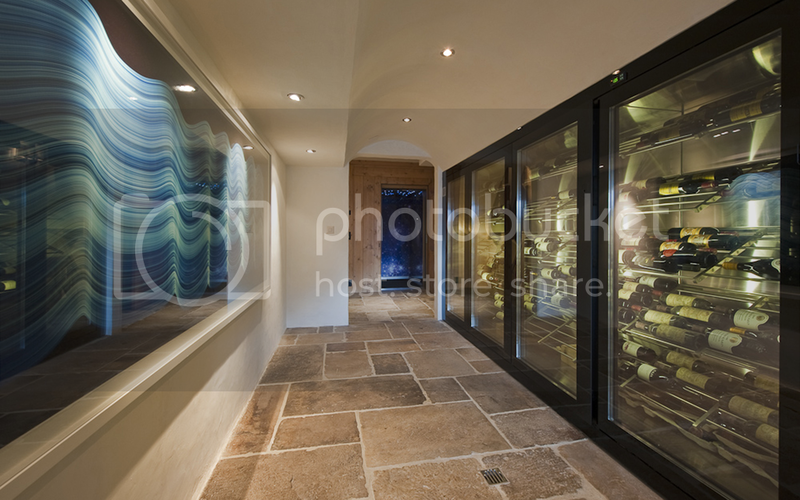 Temperature and humidity-controlled cellars have become a standard addition in luxury ski homes, ensuring extensive wine collections are stored in the appropriate conditions and displayed to impress. Chalets in Swiss ski resorts, such as Verbier may continue the tradition of a “carnotzet” too, an intimate setting and traditionally used for fondue and raclette evenings. To the uninitiated a heated ski room may seem a rather practical choice. But anyone who skis will know the value in warm, dry, organised ski gear and as such, ski rooms are now a necessity for buyers looking for a ski home. Dedicated rooms with heating facilities keep all your mountain kit in the same place, and (most importantly) that your boots, gloves and clothes are dry. According to luxury real estate agents, the perfect ski rooms are accessible from the outside and equipped with plenty of storage to keep ski gear organised. We only have to look at the most exclusive resorts in the Alps to see that these five amenities are popping up in new, luxury ski property. Affluent buyers who own multiple homes in various international locations want to feel like they are making the right ski property investment, and they seek out these features when looking to buy. Find The Viewing's luxury chalets listed on Nidski, plus more luxury chalets for sale. www.nidski.com.